Although we appeal to consumers from all over New England, Yale is a city store. Cities have smaller condos and apartments requiring smaller refrigerators. At the same time, if you want something stylish, there are only a few options. None of the major brands like GE, Whirlpool, Frigidaire and Bosch produce this type of product. So you have to look at brands like Fisher & Paykel, Blomberg, Summit and VestFrost for smaller counter depths. With a few exceptions, refrigerators follow cabinet sizes. The most common size is 36 inch width, followed by 30 inch with 24", 42" and 48 inch being less common. 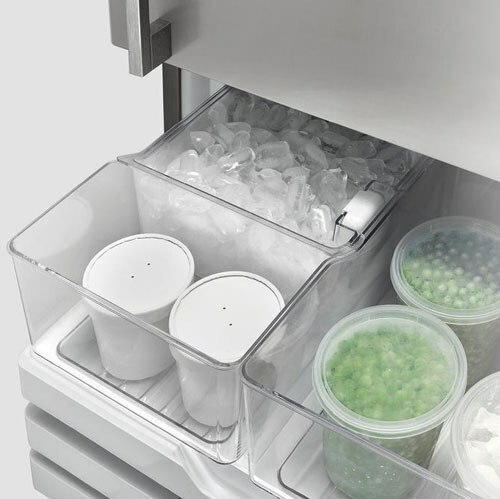 We wrote a post called Best 24" Counter Depth Refrigerators for different options. Then there are outliers. Sub-Zero has been marketing a 27 inch size for 20 years. The new Fisher & Paykel is 25 inch width, so it will not fit in a 24 inch cabinet. It would have to be customized in cabinets or will have to stand alone in a kitchen. Let's look at the Fisher & Paykel and Blomberg units and the companies as well. Fisher & Paykel has been designing products since 1934 and has grown into a global company operating in 50 countries and manufacturing in the USA, Mexico, Italy, Thailand and New Zealand. Their line is known for its high-quality apartment size brand especially in refrigeration. ActiveSmart Technology: A combination of temperature sensors with smart electronics and variable speed fans create a controlled environment and optimum temperature to keep food fresher longer. SmartTouch Control Panel: For easy access, the control panel is placed in the inside front of the fridge and have been designed to be intuitively simple and easy to use. Blomberg is a quality and trusted name in the European household appliances market. Owned by the Turkish Arcelik, the 3rd largest appliance manufacture in Europe, Blomberg has gained a sizeable presence in the average European home with a full array of products. In 2006, Blomberg products were introduced to the American market for the first time. They are a growing presence in compact laundry, refrigeration and ranges in the U.S.
EzKleen fingerprint proof which will also protect and keep the refrigerator looking new at all times. Internal Blue light, this doesn’t just look interesting there is a method behind there madness, it is for better food preservation. First, if you have a 24 inch cabinet, then Blomberg will be a default choice. I like the brand and it is significantly cheaper. However, Fisher & Paykel is larger at 13.5 vs 10.6 cubic feet or 30% more. It has better crisper bins and a dispenser option. Both are good options depending on your situation. Download the Yale Counter Depth Refrigerator Buying Guide with features, specs and inside tips to every major brand. Over 55,000 have read a Yale Guide.